Ready … Set … File! Filing. No one likes to do it. So what happens? lots of wasted time searching for things. It’s not just the fact that no one likes to file (dang paper cuts!) 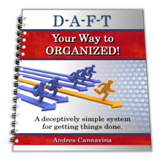 – many new to filing have no idea what to keep and how to organize it. I’ve been filing for 20+ years and when I opened my home based business, I wish I had something like FreedomFiler to get me started off right. Less than $40 (with shipping) and you not only get pre-printed labels but an easy to understand and follow filing system. Once you have received your labels, you’ll need 25-75 hanging folders, along with a file cabinet or other container meant for hanging folders. Set up takes about an hour to get everything in place. That’s it. $40 + about an hour of your time and 2010 is the first you are actually are organized! When implementing something new, it is always best to look forward and not back. That means all the crap that you have accumulated in whatever system, leave it. Don’t try to organize. You can certainly cull out the important stuff (like your original mortgage documents); however, box everything else and label it by year. Chances are, you won’t need anything, but if you do, you only have to look through a year’s worth of papers, rather than your whole life. The beginning of a new year is a great time to change. It is natural to believe that things will improve in the next year. Put in place a filing system, and they will. A huge percentage of the paper that accumulates is literally garbage. Put a wastebasket by the door you bring in the mail. Toss every piece of junk mail before you walk any further. You don’t need it cluttering your world and you won’t get to it later. Place one inbox on your desk/counter where all paper goes to be filed. It is better to file in small batches – 10 minutes here or there can do wonders. You certainly don’t want to let the filing stack up so the mere thought of filing makes you feel overwhelmed. 2010 will be my first year as a FreedomFiler. I will continue to use D-A-F-T for my on going projects and e-mail organization; and my financial binder for the accounting stuff. I am adding FreedomFiler to be the end of the process and for those items requiring long term storage. This entry was posted in Andrea C on December 28, 2009 by Andrea.